STARKVILLE, Miss. 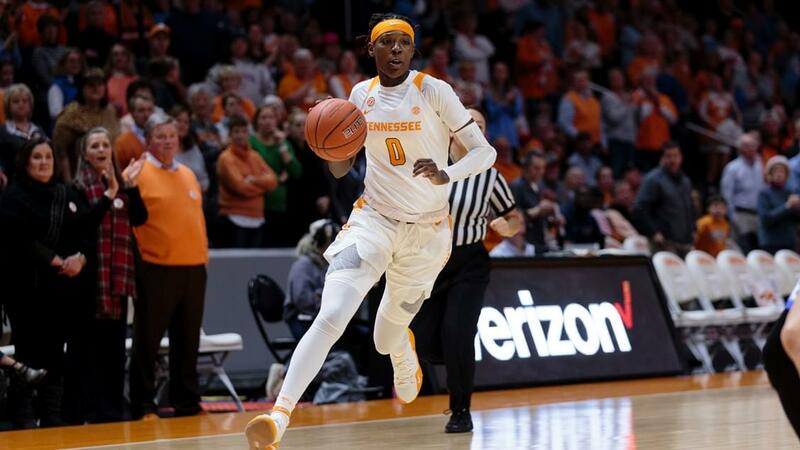 – The Lady Vols scrapped to within three in the third quarter but couldn’t overcome a No. 6 Mississippi State team that shot an impressive 52.2 percent on the day. Tennessee (15-8, 4-6 SEC) was led by sophomore Rennia Davis, who fired in a season-high 29 points. Freshman Zaay Green also was in double figures with 13. MSU’s (22-1, 10-0 SEC) high scorer was senior Teaira McCowan, who logged a double-double with 24 points and 15 rebounds. Seniors Jordan Danberry and Anriel Howard also had big days for MSU, finishing with 20 and 16 points, respectively. Howard added 11 rebounds to claim a double-double on the afternoon. The game got off to a fast start offensively with both teams scoring on their first two possessions. Mississippi State pulled ahead two and a half minutes into the contest with a 4-0 run, but freshman Jazmine Massengill answered by knocking down an eight-foot jumper in traffic and Zaay Green followed it up with a trey to tie the game at nine all. The teams kept it close through the first seven minutes, but the Bulldogs closed out the quarter with a 9-2 run to take a 25-17 lead into the second period. MSU continued its run in the second quarter with a Jazzmun Holmes three-point play, but the Lady Vols rallied back with four quick points courtesy of Davis and Cheridene Green. With 7:23 remaining in the half, Davis knocked down a three to cut State’s lead to six, then Meme Jackson converted on two free throws on the following possession to make it 30-26. The teams traded buckets before MSU went on a 6-0 spree to stretch its lead to 10 with just over a minute remaining in the half, but Davis and Jackson each knocked down threes in the final minute to cut the deficit to six at 40-34 going into the break. Tennessee went a perfect four of four from the free throw line and converted on back-to-back layups to pull within three at 47-44 at the 6:09 mark. MSU answered with an 8-3 run to stretch the lead to eight with 2:57 to play in the period. The Bulldogs went on to build that lead to 12, taking a 61-49 lead into the final stanza. MSU opened the fourth going four of five from the floor while UT went cold, hitting just one of three in the opening two minutes. That trend continued with the Bulldogs shooting a scorching 66.7 percent en route to 30 fourth-quarter points while Tennessee was held to only 14 points on 37.5 percent shooting in dropping its first game in four outings. Up Next: The Lady Vols will return home for a Valentine’s Day match-up, hosting Auburn at 7 p.m. ET in Thompson-Boling Arena. The game will be available for streaming on SECN+. Going Young: Tennessee had its youngest starting lineup of the season at Mississippi State, beginning the game with two freshmen (Z. Green, Massengill), two sophomores (Davis, Kushkituah) and one senior (C. Green). Massengill got her first career start at point guard, as Evina Westbrook sat out the game due to a violation of team rules. That Girl Is On Fire: Rennia Davis ended the day with a season-high 29 points against MSU. After suffering a shooting slump in January during which she was held below 10 points for four straight games, Davis has bounced back to lead Tennessee in scoring in three of the last four contests, scoring 24 against LSU, 19 against Florida and 29 at Mississippi State. She is averaging 17.2 ppg and 9.7 rpg in SEC play.